A stranger returns... our GM was back to lay the trail today, helped by his much better half, Bean Bag. We grouped together in the lay-by outside of the Steiner School, already sweating as the Sunday morning Range Rovers dropped off their weekly recycling. Groucho explained that the first mark was a bit of a miss, because he managed to spill the floor when he tripped over the dog! We headed away towards Cowley Bridge, and then up through the houses to a play park. It looked like there was no exit, but there was, discovered by Spocky, and he disappeared into the bushes with Child Catcher (making the most of Bull bait's absence!). Across the very dry fields which Groucho explained that he uses for dogging, sorry, dog walking. This was a new bit of Exeter to me, and it seemed everyone else on the trail. Lots of shouts of short cutting were heard, but we were just following the front runners. The amount of funds we're collecting via subs is down this year, so please can we ask that if you don't pay annually, that you offer up your £1s after each trail. Otherwise we're going to have to reduce the hash-circle beers and snacks! Speedy is going to help Spocky collect them, and he's put together a spreadsheet on his phone to keep track of everything! City of Exeter trails in August? We still have no hares for 12th, 19th or 26th August. I can lay one of them, but that leaves two gaps. I need to let Buzby know for the diary by Friday. The other options is that we have a break, and start up again in September. Let me know your thoughts. 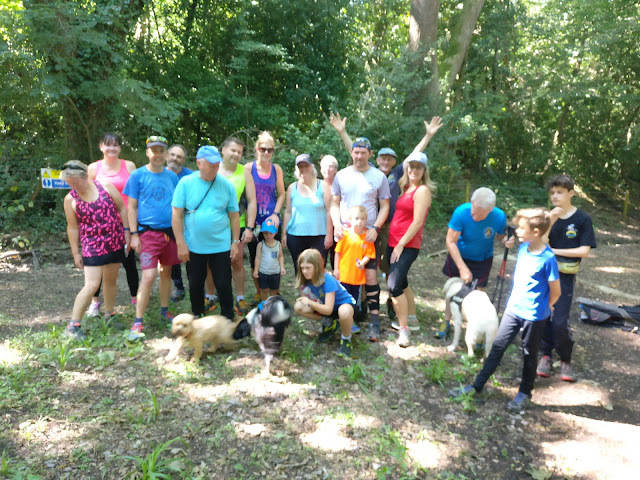 A fantastic trail this week from Woody on private land around Yeoford. 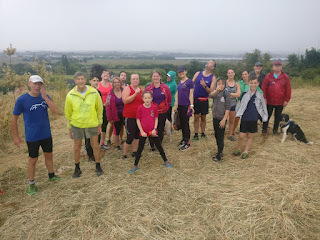 Unfortunately we forgot to take a photo - but a great trail that had a bit of everything for everyone, haha's, river crossings, bogs, heat, fish-hooks, fields, undergrowth, hills, and a push-chair route (but we had no push-chairs!). Thanks also to Woody for laying on a great after-hash BBQ and wine is her beautiful back garden! Next week we should see the return of Groucho for his trail, starting from the layby outside of the Steiner Academy, Cowley Bridge Road, Exeter (map), (SX909947). Then On Down to The Stables, Cowley Hill for Sunday lunch. If Bull Bait was worried about being humiliated, he wasn't showing it. The hash started normally - or as normal as could be expected given the 30 degree heat, and it being our 888th hash. But at the end of the opening circle, out came the surprises - and he clearly hadn't put on fish net stockings before. The pink handbag was full of forfeits - which would be undertaken as the hash unfolded. The first was doing the plank for 60 seconds, the second was kissing all the male hashers, and the third was doing three cartwheels. 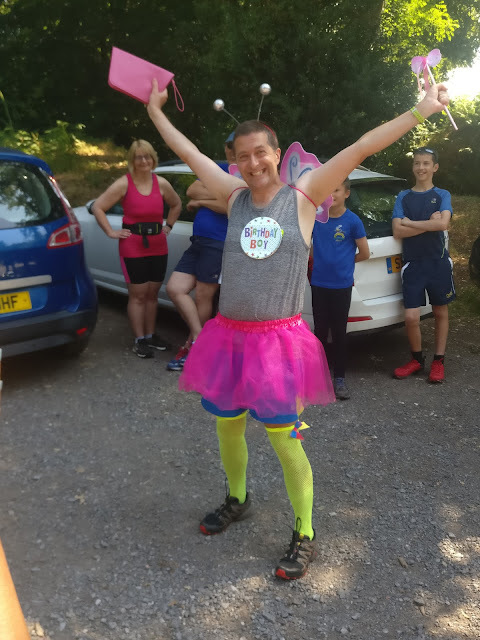 The sweetie stop was at the top of the valley by the photoframe, where forfeit number four was 10 burpees. Number 5 was ten pressups, and number 6 - back at the car park - was kissing all the harrietts. Then he (and Child Catcher) got down downs for allowing Stingray to hash in new trainers (last week). And another one for having his birthday - and the usual hash rendition of 'happy birthday'. Stingray also got fines for whinging. Just a reminder that this Sunday is Bull Baits 40th Birthday hash. Twin Peaks, Bollards and I are laying a special trail with some surprises for him J So join us to enjoy his humiliation, I mean celebration! It was a very wet one on Sunday. And I learnt that chalk easily washes away. Thanks to Strapo for looking after the indoor BBQ! Hares are required for 12, 19, 26 August and 2 September. And don't forget to Rate the Hash!